There are mountains on Pluto. Rugged mountains beneath a hazy sky that is both familiar and strange. 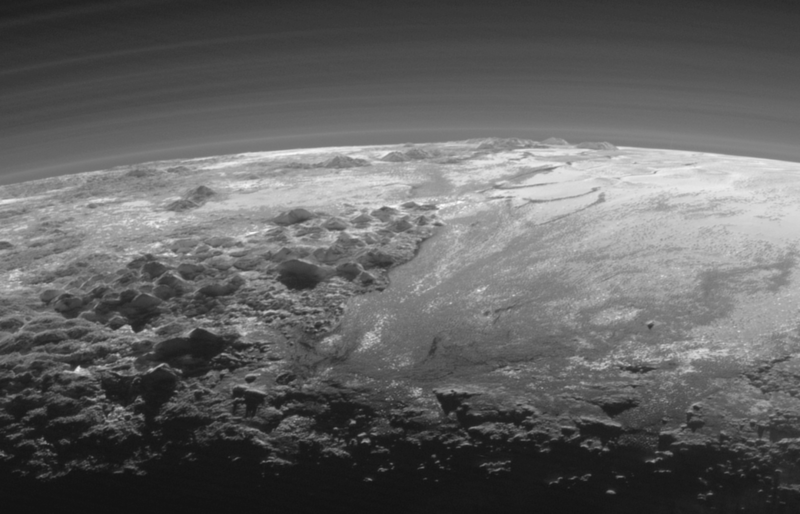 Before humans walked upon the Earth, Pluto’s mountains watched over a frozen plain. Waiting to be seen. There are lakes on Titan. There are waves of hydrocarbons that wash upon a shore of ice beneath methane clouds. When humans first noticed Saturn wandering against a background of stars they couldn’t imagine such alien lakes, but they were there, waiting to be seen. The first Martian rocks that will be gathered by humans rest upon the surface of Mars as you read this. The first asteroid to be captured currently orbits the Sun. There could be life in the subsurface oceans of Europa. Some wondrous organism waiting to be discovered. Left: first image of Pluto with moon Charon. Right: more modern Hubble image. For most of my life Pluto was little more than a fuzzy blob. Through human ingenuity we’ve come to know the amazing and unexpected geography of the once planet. It has long existed in the universe, but only now is part of human understanding. To study the universe is to be explorers, following our paths of curiosity to find what lies beyond our view. Working together as humans we’ve discovered mountains on Pluto. If we continue to work together we can find more awe-inspiring things. There’s a lot out there, waiting to be seen.